For the obsolete military punishment see, see Picket (punishment). The Picket Guard—N.C. Wyeth, illustration for poem of the same name. A picket (archaically, picquet [variant form piquet]) is a soldier, or small unit of soldiers, placed on a line forward of a position to provide warning of an enemy advance. It can also refer to any unit (for example, an aircraft or ship) performing a similar function. Picket (Fr. piquet, a pointed stake or peg, from piquer, to point or pierce), is thought to have originated in the French army about 1690, from the circumstance that an infantry company on outpost duty dispersed its musketeers to watch, the small group of pikemen called piquet remaining in reserve. It was in use in the British Army before 1735 and probably much earlier. Picket now refers to a soldier or small unit of soldiers maintaining a watch. This may mean a watch for the enemy, or other types of watch e.g. "fire picket". This can be likened to the art of sentry keeping. A staggered picket consists of, for example, two soldiers where one soldier is relieved at a time. This is so that on any given picket one soldier is fresh, having just started the picket, while the other is ready to be relieved. Although each soldier is required to maintain watch for the full duration of a shift, halfway through each shift a new soldier is put on watch. ^ Matthews 1922, p. 90. 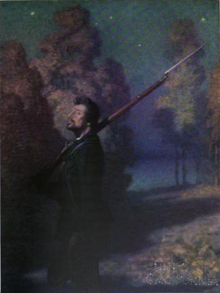 ^ "The Picket Guard is a Body of Men always to be ready, lying with their Arms in their Hands, to turn out in case of an Alarm; but are not commanded by the next Officer on Detail, but such as are appointed by the Picket; but must march either faster or slower, to sustain Out-posts, Foraging, Escourts, or any other Service; and it shall be allowed them in their Tour of Duty" (Gittins 1735, p. 165). Look up picket in Wiktionary, the free dictionary. This page was last edited on 5 February 2019, at 22:52 (UTC).